The scent of his own blood shakes away the disbelief of the gunman entering the city council room. Jeremy remembers that smell and can’t deny that he is once more the target of a gunman’s bullet. Surviving means learning how to do everything again—from walking to love—but having Daniel in his life might make it easier this time. 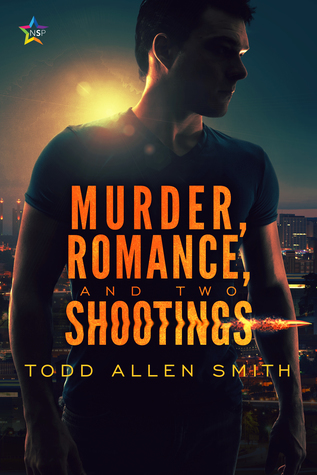 Murder, Romance and two shooting isn’t the typical book that I’m used to reading. It’s not a fiction, it’s not a romance novel, it’s not a mystery novel either. It’s real facts, it’s an autobiography, it’s a testimony…. And I loved it. I must emphasize that I read the ARC version, and the main character was named Todd. The book starts in 1997, 21 years ago, when Todd, a young man—freshly graduated from college and with a broken heart—moves in Delaware with his best friend, Kevin, who already lives there. A few days after moving in, Todd was shot in the leg by two guys who tried to rob him. That starts a long and painful process of recovering. Months after being shot, Todd moves back to his hometown. Life starts to get back to normal. He found a job, a boyfriend and was able to have time with Rick (his other best friend) until Rick was brutally murdered in a gay bashing. Todd lost his best friend, his boyfriend and his job approximately at the same time. Years later, he was back to St Louis and met David. When Todd thought life was finally good, he was shot again, and then the long, painful process of recovering starts over with all that it implies. This book is the real life of Todd Smith, the author and it’s his first book. When I started the book, I was perplexed about the writing. It was well written, with good editing, but I was surprised by the way the story was told. It was a succession of facts. The author doesn’t try to make us cry or smile, he doesn’t try to force feelings on us. He just told his truth, his life and what he’d been through. He relates facts exactly like a journalist relates events…. It’s the same process here, and it works for me, I cried with him and for him. I’m impressed by his courage to stand naked in front of us, telling us what it really is to be shot (nothing glamourous like in the TV), to come out to his family, what it is to lose a friend brutally in such an awful manner. How he met the love of his life, what they’d been through together, how his PTSD and depression had put the couple in danger, and how they almost lost each other. The author gives us a piece of himself. He isn’t a superhero, just a normal guy that life put through hell. I respect him more for that. This book deserves to be read. I’m sure a lot of people can relate to Todd story, even if you weren’t shot, you can understand how it feels to be lost, to lose your mind, and not know who you are anymore. It’s 4 OptimuMMs… Because Rick!